Can this mixing desk channel emulation newcomer dent the market? For more advanced engineers looking to push their mixes up another notch, Satson is an attractive option. Simple, 'load and forget' solution. Extra back-panel colouration options. VU meters with calibration. Good-sounding ¬filters. Reasonably low CPU hit. Affordable. No global bypass control. It's not a console-specific emulation. Console channel strip plug-ins have been with us for a while, offering emulations of the EQ and compression found on famous hardware mixing consoles. However, we're now starting to see plug-ins that emulate the subtle sonic and dynamic behaviour of desk channels and busses themselves. That is, the sound you get just by running a signal through a channel, even with its EQ and compression disabled. The new kid on this block is Sonimus, whose Satson plug-in is designed to be inserted on your channels, busses and master output. The package contains two plug-ins, Channel and Buss, each offering a slightly different sonic flavour. Both come in mono and stereo versions. The underlying concept is that the plug-in saturates like an analogue console, imparting that flavour to your mixes. However, this is no 'black box' solution. For example, the Channel plug-in includes adjustable input level (+/- 18dB), high and low-pass filters, VU meter and saturation bypass. There's also a Fat option that enhances the saturation for a given signal level. 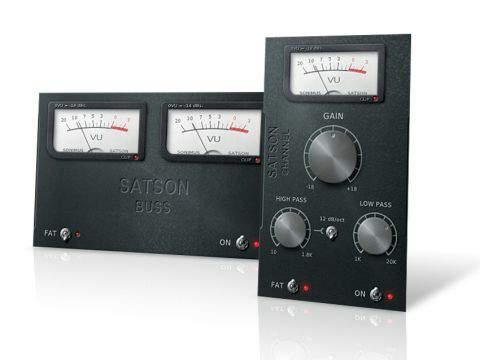 Clicking the Satson logo reveals three back-panel settings: Super Gain (+/- 24dB); Output Compensation (so the overall volume stays about the same when you increase the gain), and a CPU-saving mono option for stereo-only DAWs. The Buss plug-in has fewer controls and no input level. However, you still get the Fat option and a further back-panel Loud setting that adds more saturation to high and low frequencies. The Buss plug-in also includes stereo crosstalk by default (the back-panel 'dual mono' option can disable this). Finally, both plug-ins include VU meters with two 0VU alignment options, -14dBFS and -18dBFS. Although Satson doesn't emulate one specific console, the rumour is that it's influenced by SSL's 4000 Series. With the plug-in across all our channels, and the Buss variation across our sub groups and main output, there is what can only be described as a subtle enhancing effect. This feels like a combination of a bit more air and some mid-range presence and edge, plus some glue in the lower frequencies. Listening to the Channel and Buss instances individually reveals sonic differences, and analysis tools show what looks like a general mid-to-high-frequency lift on the Buss plug-in, rather than the more defined mid-range and high-frequency lift seen on the Channel. We also noticed that the stereo crosstalk mostly affects high frequencies (or at least is most noticeable in that range). Satson is more than just an EQ curve, and with dynamic material such as drums we're able to identify the low-frequency saturation that both plug-ins add. As mentioned, this can be gentle, even when using the Fat or Loudness settings. If you want to push things harder, there's plenty of gain available (the auto gain compensation is very welcome), but the sound never becomes nasty. The only other thing to mention is that the filters are gentle and musical, rather than surgical or coloured. Overall, we feel Satson works best as a 'load and forget' processor that enhances your mix. A global bypass option would be nice, but considering the $39 price-tag, this is something we can happily live without. Drum Kit: Here we have a full multi-miked drum kit. Initially with no Satson plug ins then (0.13) with them across all individual channels and the master buss. A/B ing between the two you can hear the subtle enhancement (0.22 to 0.35). We then (0.57) set just the buss plug in to 'fat' mode and A/B to compare (1.08 to 1.21). Finally we set all channel plug ins to 'fat' mode (1.41) and A/B to compare (1.52 to 2.05). Band: Now we have drums, bass guitar and guitars. First up, with no Satson, then (2.35) with Satson across all tracks and busses at unity settings and A/B to compare (2.48 to 2.56). Then (3.19) with just the busses on 'fat' and A/B to compare (3.32 to 3.39). Finally (4.03) with all plug ins on the 'fat' setting and A/B to compare (4.16 to 4.24).